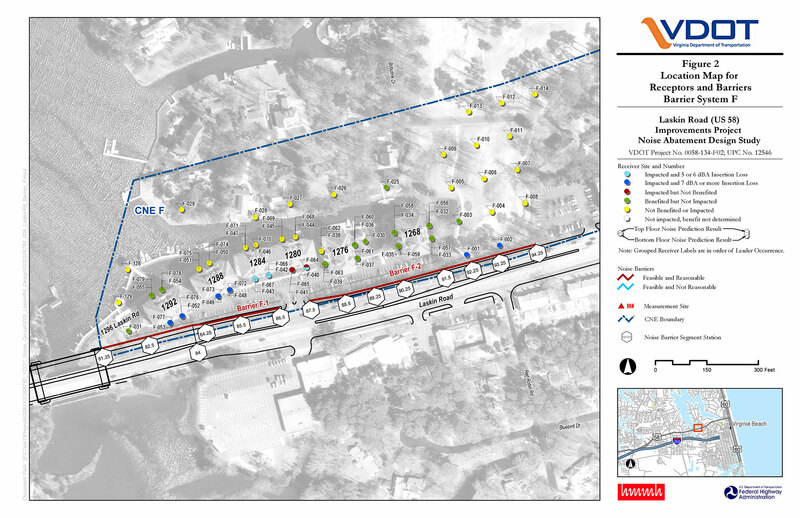 HMMH performed the noise impact assessment and preliminary noise abatement evaluation for the Laskin Road (U.S. Route 58) improvements project, an urban arterial located in Virginia Beach, Virginia. The study also included a detailed noise abatement design study for a small section of the project to serve as the final design noise analysis. The study included monitoring of existing noise conditions and modeling of existing and future conditions with the Traffic Noise Model (TNM) 2.5. Noise impact was assessed at many residential, recreational and institutional land uses, and noise barriers were evaluated for many of them. Noise abatement in four primarily residential areas was found to be feasible and reasonable. One barrier was evaluated for final design to benefit a condominium complex with many impacted balconies and portions of a golf course. The barrier would benefit 37 receptors at a length of 1,200 feet and an estimated cost of $850,000.